Barracuda Lacrosse is an outlet for players to build on their game playing at the next level. There are two parts to Barracuda Lacrosse. Competitive traveling minor A teams in the Midget ('03-'04) and Novice ('09-'10) age groups that compete in tournaments. Competivite traveling minor A teams playing in the new Saskatchewan A Lacrosse League (SALL) in the Peewee ('07-08) and Bantam ('05-'06). More details on the SALL will be out at the begining of February. Junior B Tier 1, a Major Junior Tier 1 team competing in the Rockey Mountain Lacrosse League (RMLL). All coaches will coach the same style of play and will have a benchmark of skills that will be coached at each division. team will have coaches that have coached young lacrosse players both at high levels and house leagues. These teams will be rostered from Novice and Midget players that are registered to play with the SLA through their local Member Association. Players that make the team will play on both their house team as well as the Barracuda team. The Midget A team will travel to Saskatoon and Alberta taking part in tournament play. This team will also practice at least once a week a. The Novice A team this team will practice once a week leading up to the Calgary Canada Tournament. Tryouts dates will be at the end of March/Begining of April. Estimated Team Fees are $750 for Midget and $500 for Novice, Fees may be less if player has jersey/shorts and or helmet. Estimated Team Fees are $750, Fees may be less if player has jersey/shorts and or helmet. 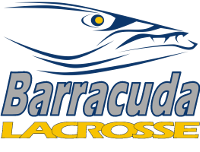 2019 will be the second season for Barracuda Lacrosse's Junior B Tier 1 team. Players from southern Saskatchewan are invited to come out and try out for our team. We are looking for the best and brightest lacrosse players the southern SLA Member Associations have to offer! These associations include the QCMBL, MJKLA, WMBL, EMBL. For more information on the Junior program please email . To keep up to date on all things Barracuda follow Barracuda Lacrosse on twitter, @barracuda_lax.